I found out about hypnobirthing from an advert given out at Yoga Bellies.After having looked at the national hypnobirthing website (www.hypnobirthing.co.uk) to find out more, I contacted Sandra and she invited us for a cup of coffee to chat about the course that she offered. I was already becoming aware of the pregnancy horror stories and wanted to find a different way to approach pregnancy and birthing without the fear that these stories can create. Kevin was happy to come along and find out more, although I suspect he harboured a little scepticism. Sandra made us feel instantly relaxed. She was clearly very knowledgeable about all aspects of pregnancy and her warm and friendly manner created an instant connection for us. We signed up for the course straight away. Very early in my pregnancy I had already been labelled as “at-risk” due to a pelvis fracture over a decade ago. This despite having run marathons since. I can’t say the pregnancy was easy. In the first trimester I had nearly constant nausea, sciatic pain and then from 8-weeks I developed pelvic girdle pain and had to stop running and later on was unable to walk more than 200 yards. I have always had low blood pressure and the pressure of Zak when sitting caused me to have a number of fainting episodes. However, the hypnotherapy course, the rainbow and the deepening meditations that Kevin led for me all combined to make me less anxious about everything that was happening and how to recover from the more wobbly moments. I listened to the birth affirmations and the rainbow relaxation on the CD every day. With my husband we did the deepening meditation and light touch massage about twice a week. We saw the consultant obstetrician at 28 weeks. He was very good and listened to our wishes for a natural vaginal birth. But he recommended that we had a growth scan at 32 weeks to establish the size of Zak’s head, even though the final width of the birth canal could not be measured at any time. All pretty irrelevant really. He also referred for orthopaedic opinion, which we cancelled afterwards having done some research about successful vaginal birth after pelvic fracture and that there was little evidence to support elective caesarean. We had initially wanted a home birth, but the community midwife did not recommend this as we did not live close to the hospital. We weighed up the pros and cons and decided that we would not be happy to take the risk should there be complications. 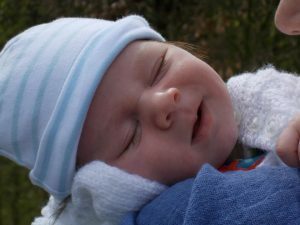 We ensured our birth plan indicated our intention to have a natural hypnobirth, that we wanted minimal noise and interruptions, that I did not want and clearly indicated how we wanted to handle induction. Zak’s “calculated” due date was 29th March. I had been having a regular series of Braxton-Hicks from as early as 36 weeks. In fact 6-days before his due date, a series lasting about 4-hours between 4 and 8 pm had us convinced that things were on their way. But it was just a practice run. We had a number of these over the next week and into the 41st week. All very tantalising but at the same time frustrating, especially after the due date had passed. We saw the community midwife at 41 weeks and I was offered a membrane sweep at this appointment which I declined. I was sure nature would take its course and Zak would come when he was ready. So on Saturday 5th April at 6:40 pm I thought my IBS was playing up, despite going to the loo I still felt some sensations in my lower abdomen. I was convinced it probably wasn’t labour starting as this was more comfortable than the previous practises! Kevin suggested we go for a walk in the village to see what would happen – a series of very frequent (every 2 mins) surges came and went as we walked down the lane. As we were returning to the house, our cat Charlie was studiously waiting at the end of the block of houses. Did he know? We retired to the bedroom where I used the birthing ball and wandered around the room sitting and standing between the surges. The surges were very irregular and we were convinced they would stop again. Kevin rang the ward to let them know just in case. We remained at home with the lights dimmed, candles burning and the hypnobirthing music playing. My bowels opened several times and I began to be convinced our baby Zak was on his way. After a couple of hours of timing the irregular surges, which lasted from anything from 20-120 seconds, our other older cat became rather bonkers: he would not settle until he had climbed all over me and clung in my arms; the latter bit we captured on video! Did he know? Around 11:30 pm I had a shaky do whilst at the toilet and a series of very powerful surges and it felt the right time to go to the hospital. Kevin rang the ward and let them know and was somewhat relieved to be going to the ward. We arrived on the labour ward at around 00:30 to be admitted by one of the community midwives who was helping out as the ward was very busy. Janet was lovely and respected our birth plan. Janet remained our midwife until 2am and was very gentle and supportive. I was offered an initial VE which I did actually want as I was really wanting to know how far on I was! We were pleased that on arrival I was already 3 cm dilated. We settled in our room with the light very low, the electronic coloured candles glowing, a sign on the door saying hypnobirthing in progress, avoid unnecessary interruptions and the background hypnobirthing music playing softly. I felt very calm as the surges came and went. Light touch massage by Kevin was lovely and helped me relax. At 2am there was no midwife free to take over our care initially so the midwifery coordinator stood in to monitor us for an hour before our next midwife was free. Our next midwife was very experienced if not a little too chatty for hypnobirthing but to be honest I blocked her prattle out and let Kevin answer! She did realise this as she said to me ‘maybe I shouldn’t be talking so much’ my silence maybe said what needed to be said. I remained breathing through the surges with Kevin’s amazing support. At some point in the later hours (I stopped looking at the clock) and accepted another VE indicating I was 6cm dilated. I was a little disappointed as I wanted to be 8cm! but still good progress so I couldn’t complain! A little time later (I think) my waters gave way with a bang – quite funny actually! By the time the early shift started and the next midwife and her student came on duty I was having very frequent intense surges. I had tried gas and air earlier (having told myself not to bother for a while) but it did not actually provide any effect – no spacey feeling, no dizziness, nothing!, so I slung that to one side and continued to get on with it myself! I can’t say I was quiet either! What struck me was this primal inner response of moaning, quite loudly LOL! I simply could not inhibit it and it helped birth Zak down for sure. I remained calm and relaxed using the breathing techniques and I did need to bear down to crown him, breathing down for me was not enough. I had one wobble which I think was in transition where I said I was tired and wondered if I could do it – those that know me, know me for being a tenacious sod and one who never gives in. Kevin helped me so much by counting down as the powerful surges came, which helped me focus at least for half of the wave! Zak remained a calm baby with his heart rate ranging 135-145 bpm throughout all the birthing phase. Zak was born at 09:26 am Sunday 6th April with no intervention and birthing in the desired position. Although at the last minute he took his arm through with his head and came through like superman! A slight baby cry was voiced and he was then passed immediately to me and placed on my breast. He began breastfeeding within minutes. His cord was clamped only after it had stopped pulsating and the placenta delivered 20 minutes thereafter physiologically. What a chilled baby he is and what an amazing experience; one that we will never forget. The importance of remaining calm and viewing childbirth as a natural process helped both myself and Kevin throughout the entire birthing. There was no need to fear what women were made to do. Hypnobirthing is fantastic and it helped me stick to my biology and strong mind set. A note to the obstetrician – Zak in the end was a big boy weighing in at 8lbs 7oz despite mum having a small bump and being slim hipped who happened to birth him just fine . Funny that. Thanks Sandra, for opening our eyes and supporting us!